Nigeria’s commercial capital Lagos is considered one of the continent’s megacities thanks to its bustling nature with the ever-growing population and business boom. Lagos has high-rise buildings housing residences and apartments, it has slums and poor neighbourhoods and it boasts a mainland and island. But in the midst of the many wonders of Lagos is a two-faced building – a multi-story building in an area called Bamgbose in Lagos. This building has a unique feature of being half plush and half deprived. An editor with the BBC Yoruba Service says the contrasting views on the same facility is what gave it the name ‘two-faced’ building. So what accounts for the two-face? 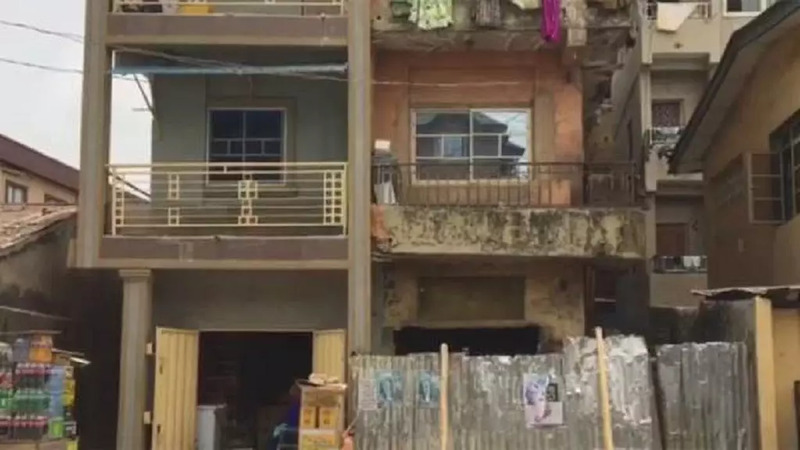 Temidayo Olofinsawo said when a team went to investigate, they found that the facility belonged to two siblings who inherited it from their father. Occupants said the sister had renovated her part of the structure into the plush state it is, whiles the brother is yet to do so, hence the contrast that the same building had to live with.